Beach weddings are growing in popularity, as more couples decide to reconnect with nature and their families, while expressing their own unique style. One of the best places to have a beach wedding is at Sea Ranch Resort, Outer Banks, North Carolina. 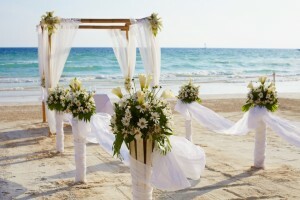 When planning a beach wedding, one of the most important things to do is find your out-of-town guests a place to stay. Fortunately, Sea Ranch Resort, one of the Outer Banks oceanfront hotels with breathtaking views of the sea, your friends and family will be scrambling for an invitation. For couples wishing to stay in the area longer, it is possible to acquire Outer Banks oceanfront condo rentals for long-term visits. When booking your Outer Banks oceanfront hotel rooms for friends and family, be sure to ask our front desk about discount rates for large groups. Also inquire about having the rooms placed in the same area of the hotel, so that people can meet up during their down time, if they so wish. Depending on the time of year and hotel capacity, this may not be possible, so don’t take it personally if they are unable to accommodate this request. Of course, Outer Banks oceanfront hotels are suitable for many functions beyond giving your guests a place to stay. Consider having your reception in the hotel’s ballroom or event space. The sea view will lend itself to your decor, and you will be able to taste local cuisine for your dinner. Hosting your reception in the same hotel as your honeymoon suite will make it easier to end the night without investing in extra transportation, as well. Planning successful Outer Banks weddings may seem difficult, but it is not much different from planning a wedding at home. By simply preparing travel and hotel accommodations for guests and bridal party in addition to choosing a venue, caterer, and other vendors, you are sure to have a wedding to remember.